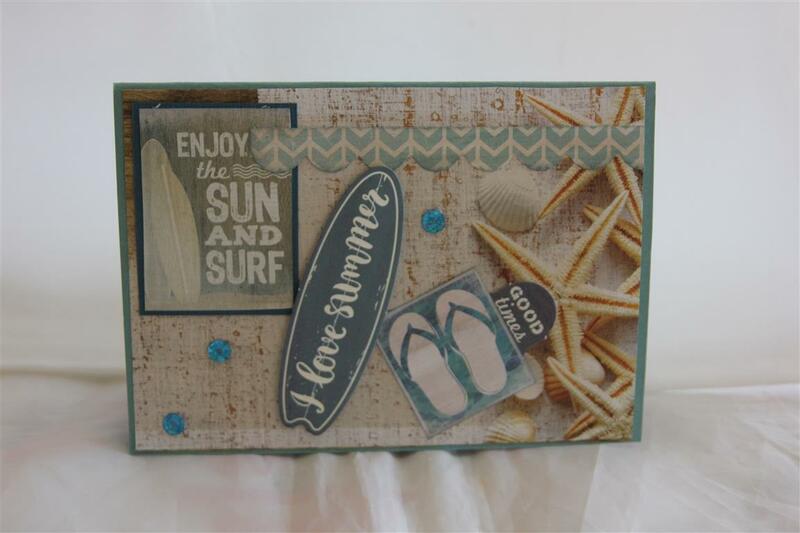 Kaisercraft sandy toes 6 and 7 ..the last.. Here are the last two cards I created with kaisercraft sandy toes.I will revisit the rest of this paper again, once I have finished sorting out that craft room, which may take a little while.The top card uses some 12 x 12 paper and collectables, while the bottom card has the addition of some sequins,a brad, and some prima trim. 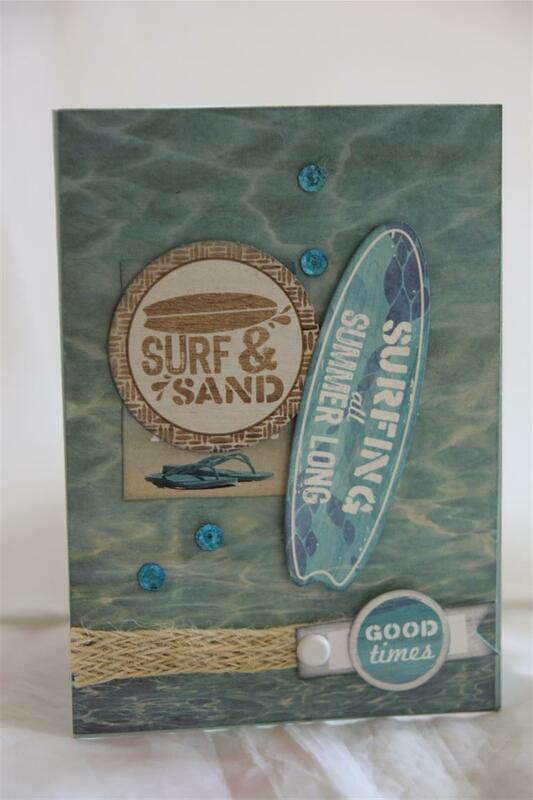 I love the background paper on the bottom card – makes me feel like you could just dive in and with our weather heating up over the next couple of days finding some cool water to swim in is possibly on the cards!! 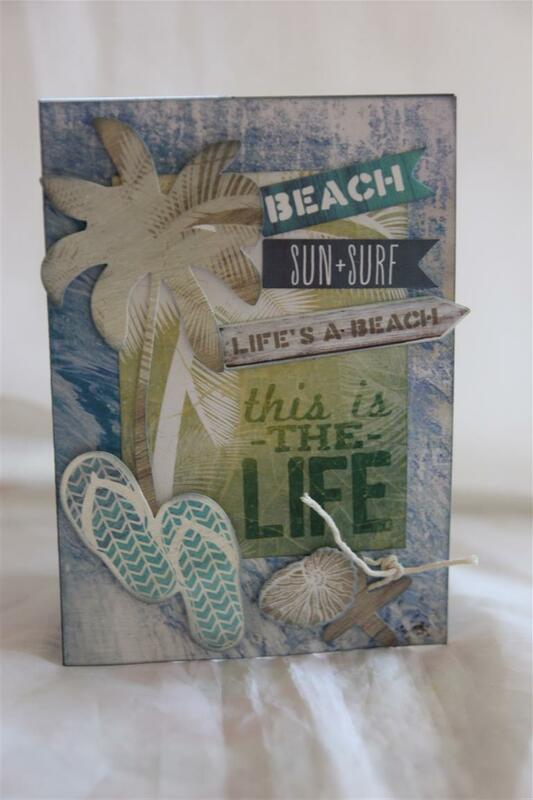 til tomorrow…..
Kaisercraft sandy toes .. The background paper is from a piece of 12 x 12 paper, and the rest of the card uses bits and pieces from the 6″pad.A couple of sequins and thats it!Today I have been in the craft room, making a few cards to use up more papers. I am making some headway in the aim to clear some of the backlog of paper, and have made up a few bags of bits,strips and bobs to sell at my craft fair stall in June.The only trouble I am having is seeing the old paper and seeing it with new eyes …and thinking oh, I could do that or that, and then it’s back to the craft table to make more cards, so this is going to be a long job! Til tomorrow…. 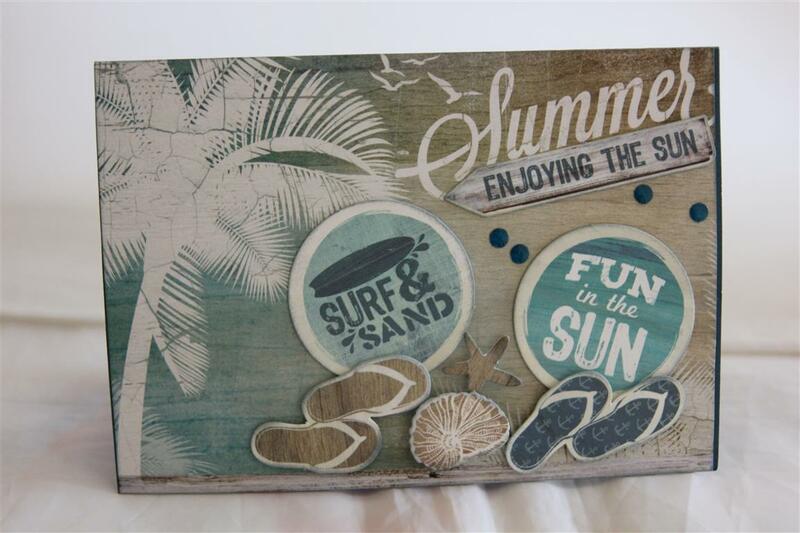 Kaisercraft sandy Toes paper and matching collectables. The trim ( I love!) 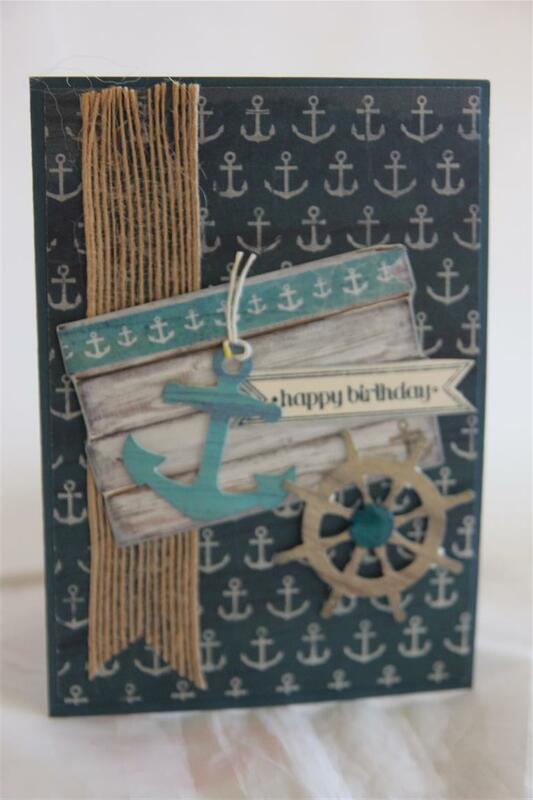 is Prima, and I used a kaisercraft sparklet and stampin up cardstock and bitty banner sentiment. Perfect male card right there!I haven’t been in the craft room today, I went over to Paper flourish this morning to drop off my March classes, and ended up visiting all morning! I was looking for some papers to get a head start on April lessons, but while there a new shipment of Kaisercraft Dies came in. I love their dies as they are so easy to use – the dies cuts just fall out – no struggling, so I bought a couple more to add to my growing collection. I don’t think I will buy any other brand now, Kaisercraft seem to be coming out with new ones every month so there is always a good choice.Til tomorrow…. Kaisercraft Sandy Toes..and a lot of the matching collectables on this one. I inked around all my edges for definition, and added a few sequins.First day of my holidays, and I was going to pick up the new release of Kaisercraft from paper Flourish, but it hasn’t come in yet, so I spent the morning in the craft room finishing off my March classes, and cleaning up my craft table – I can see it again! I have promised myself that I won’t let it get like that again . I have a new 6 drawer cabinet which I have put in the crafting annex to hold all my christmas dies, embossing folders, papers etc, so that may be a job for tomorrow.Til tomorrow…. 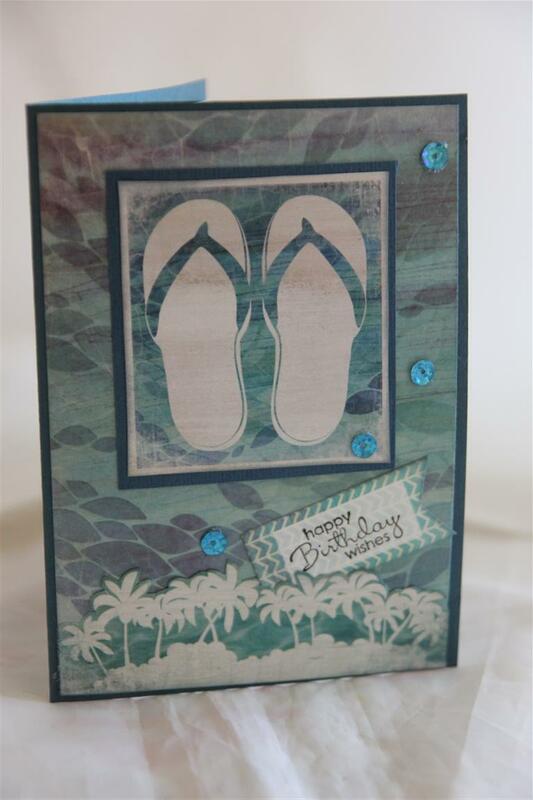 Today we start a new collection – Kaisercraft Sandy toes.Great paper collection for this time of year although we have been lucky here lately – not too hot at all, just lovely sunny days.For this one I did some basic layering, and fussy cut the palm trees from a panel to place at the bottom of the card, stamped a sentiment with a stampin up stamp, and added a few sequins ( my new like) scattered across the card.Now that I have a couple of weeks off I will be visiting spotlight to get a few more colours.Til tomorrow…. As today is so hot here I thought it would be a good idea to put up a card that makes me feel cool while I look at it! 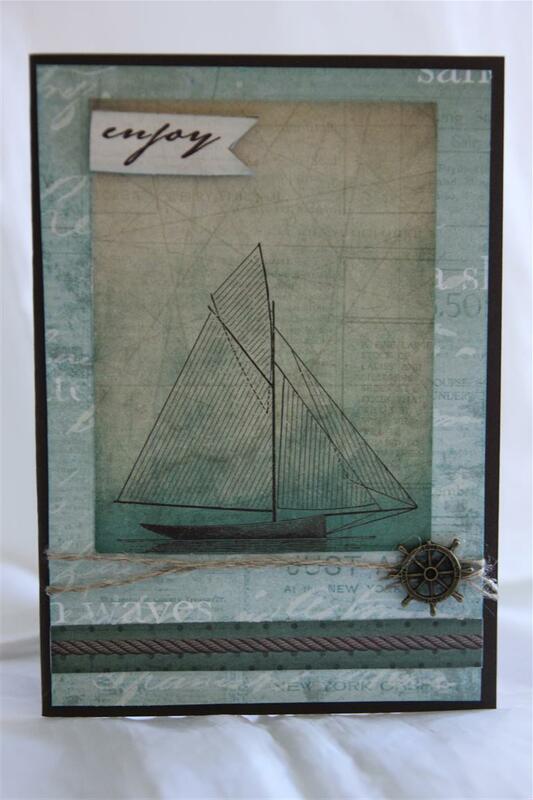 The paper collection is a new release from Kaisercraft – Sandy toes, and is full of lovely patterns and cool colours.I inked around all my edges with shades of blue and green distress ink, and added a bit more colour to the panel with the ship on it too.Wound a little linen thread around my main panel, and added a charm to finish.I am off now to finish wrapping some presents, and then I think I am all organised for Christmas! til tomorrow…..